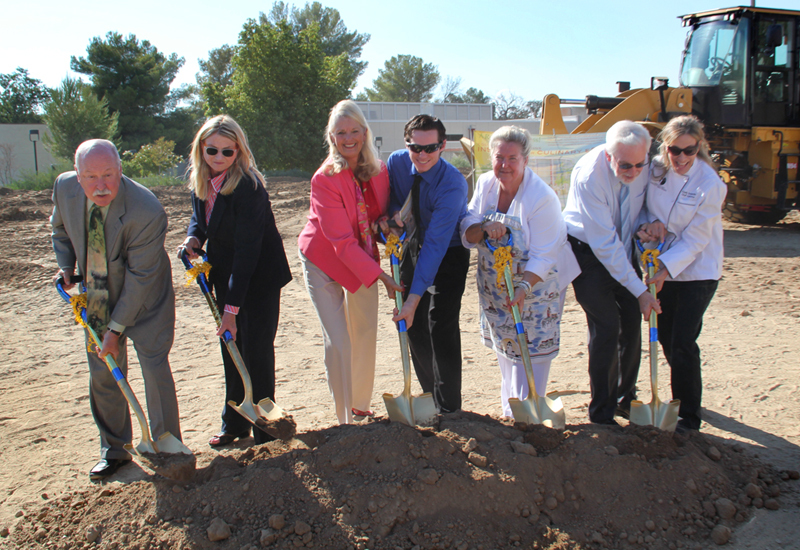 August 19, 2013 — From left: COC Board Members Steven Zimmer and Michele Jenkins; COC Chancellor Dr. Dianne G. Van Hook; Student Trustee Ryan Joslin; COC Board Members Joan MacGregor and Bruce Fortine; COC Culinary Arts Instructor Cindy Schwanke (lead iCuE faculty member). Photo: Jesse Munoz/College of the Canyons. 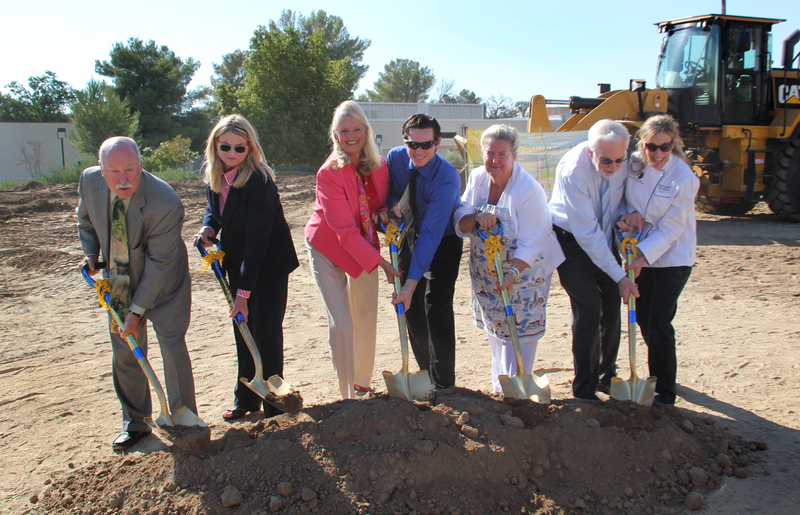 College of the Canyons officials held a groundbreaking ceremony Monday for the future Institute of Culinary Education (iCuE) building on the Valencia campus. "We really are excited about this event," COC spokesman Bruce Battle said. "Since the culinary program began at COC, it has had great response from students and faculty, but it needed a place to grow." The new building will be located to the south of Mentry Hall, where it will host laboratories, kitchens and classrooms. "The program itself has been up against the limitations of the classrooms that we've been at," Battle said. "We have had to cap it at smaller class sizes. Twelve thousand square feet is a lot of space to work with, and I expect every foot to be filled." Specific elements include a show kitchen, a savory kitchen, a sweets kitchen, a banquet kitchen, a wine studies classroom, multiple culinary labs and instructor office spaces. "It's nice to have a permanent home and new resources. We hope to see tremendous growth," Battle said. "The classes and resources will be second to none. It's a great facility." The $8 million construction cost is being covered by district general funds, donations, and Measure M bond funds. "Today is a celebration of collaboration and partnership of what we've accomplished by working together," COC Chancellor Diane G. Van Hook told a crowd of onlookers. "I want to thank all of you and congratulate you on your willingness to support us, so that we can serve our community in the best ways." Enrollment at private culinary institutions can cost $50,000 per year, while College of the Canyons costs $46 per unit, officials noted. "Having an on-campus culinary facility will make a significant difference in the lives of students who are trying to manage their time between the classroom and the kitchen and begin their careers," said Cindy Schwanke, COC culinary arts instructor and lead iCuE faculty member. "The food service industry continues to grow and employ millions of people. It's exciting to know that College of the Canyons is a part of that." The building is scheduled to be completed during the Fall 2014 semester, with the first students being able to use it in Spring 2015. "Everyone, enjoy the moment — all the chefs and students that came on their summer break. This is a moment," Schwanke said. "I have two words that I want to steal from Oprah Winfrey: ‘Dream big. Dream big.' Thank you, Chancellor Van Hook, for allowing me and inspiring me to dream big, allowing my team to dream big. Here it is, to dreaming big." CO1310a: 9600 dpi jpeg from digital image by Jesse Munoz/COC.